Ickwell v Renhold. All pictures David Kay. Phil Matthews, Ritchie Bevan, Will Scutt and Joe O’Donnell were Flitwick’s goalscorers against two in reply from Ryan Lewis. Shefford drop to third. Up into second spot and just goal difference behind are Wilstead who retained their 100% away record when winning 3-1 at bottom of the table Sandy. Tom Stonehouse, Paul Jones and Sean Harrod all found the back of the net against a lone home reply from Jack Webb. Missing the opportunity to regain the leadership were the now fourth place AFC Kempston Town & Bedford College whose three game winning run came to an end with a 3-1 defeat at Caldecote, who duly retained their seasons 100% home record to climb the table into seventh spot. Nicky Albone and Gary Baker scored for the home side against a penalty reply from Courtney Boughton for the Town. Whilst now fifth place AFC Oakley M&DH also missed the chance to top the table when defeated 0-1 at home by Cranfield United for whom Jordan Conway netted the vital goal. Now up into sixth place are Renhold United who stretched their unbeaten run to five games by winning 3-1 at Ickwell & Old Warden. Alex Liburd found the net twice and Shay Fenlon once against a lone home reply from Dan Threadgold. Whilst also still unbeaten on the road this season and now holding down seventh spot are Sharnbrook, 2-0 winners at Stevington thanks to successful spot kicks from Simon Denton and Chris Prior. Elsewhere the clash of the Weston Park inmates was to end all square at 2-2 between Marston Shelton Rovers and Wootton Blue Cross. Alex Wallace and Harry Baker marked the Rovers scoresheet against a brace in reply from Robert O’Dell. Whilst over at Hillgrounds Kempston Rovers Development had to settle for a share of the spoils in drawing 1-1 with Ampthill Town Reserves. Sam Smith on target for the Rovers and Jack Fuller for the Town. Meltis Albion now find themselves three points clear at the head of Division One supported by Wests Citroen Bedford after maintaining their unbeaten ways with a 4-2 victory over The 61FC Luton Reserves. Asa Garlick, Gary Townsend, Carl Townsend and Alexis Kamenan were the Albion goalscorers against a brace in reply from Abdullah Ahmed. Whilst up into second spot and heading a trio of clubs on 10 points are Queens Park Crescents who retained their unbeaten ways by winning 2-1 at Westoning to end their hosts’ 100% home record. Daniel Rasol and Raheem Jabba were the Crescents marksmen against a lone home reply from Nick Shirley. Now in third spot and still unbeaten this season are Henlow, 1-0 home winners over AFC Kempston Town & Bedford College Reserves for whom Luke Hills netted the goal to keep them goal difference ahead of Totternhoe Reserves who maintained their 100% away record with a 2-1 victory at Ickleford. Brayden Judge and Charlie Beary were on their scoresheet against a lone reply from Gareth Head. The biggest win of the day belonged to Shefford Town & Campton Reserves the 5-2 winners at now bottom of the table Old Bradwell United Reserves to claim their first victory of the season. Chris Clark with a brace was joined on their scoresheet by Malcom Marimarofa, Josh Goor and Oakley Carr to bring up the nap hand against home replies via Aaron Murray and Lewis Gray. Whilst now off the base of the league are Cople & Bedford SA who claimed their first point of the season when drawing 1-1 at the still unbeaten Crawley Green Reserves. Paul Nigro was the SA goalscorer against a home reply from Adam Marsh. Elsewhere over at the Warren it was a 3-3 draw between Elstow Abbey and M&DH Clapham Sports in a game that saw the visitors take an early lead but then need to come from 3-1 behind to salvage a share of the points. Dom Parrella with a brace and Lucas Benton netted for the home side against replies via Jordan McGoldrick, Oliver Thorne and Glen Tumulty. Wixams are now four points clear at the head of the Division Two league table after maintaining their 100% home record with a 6-2 victory over AFC Oakley M&DH Reserves. Gaz White led the way with a hat-trick and joined on the scoresheet by Andy Wale, Luke Northwood and Iain Hall against M&DH replies via Kade Walker and Nathan Aulsberry. Now up into second are Lea Sports PSG who remain unbeaten for the season and still 100% at home after beating Atletico Europa 5-1. Joe Hennem with a brace was joined on the scoresheet by Rhys Cadger, Dylan Cadger and Will Tyler to bring up the nap hand against a lone reply via Tinashe Makcombe. Also still 100% at home this season are third place Cranfield United Reserves, 5-2 winners over Sundon Park Rovers who are still looking for their first win of the season. Jacob Bassett, Adam Kerr, Joe Sames, Antonia Ricciardi and a Ryan Collis penalty marked the home scoresheet against Rovers replies via Jordan Holmes and Ethan Tenn.
Whilst now in fourth spot are Riseley Sports the 4-2 home winners over Kempston Hammers Sports. Jamie Simmons with a brace joined on the home scoresheet by James Bowen and Sam Harrison against Hammers replies via Luke Walker and Chris Greene. There was joy on the road for Flitwick Town Reserves, 4-0 victors at now bottom of the table Houghton Athletic. Mark Fennell, Sean O’Donnell, Dan Abberley and Ryan Short were the Town scorers. Caldecote Reserves gained their first away point of the season when sharing the spoils in a 4-4 draw at Potton Town. Sam Julian with a hat-trick was joined on the Caldecote scoresheet by Tom Wallace against Town replies via a trio from Tom Grinstead and a single strike from Jack Sales. There is no change at the head of Division Three despite the top three sides all having to settle for a share of the spoils. 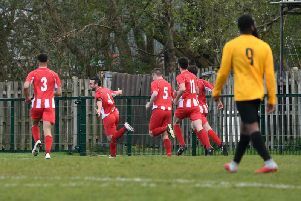 For leaders Kempston Athletic it was an end to their four game wining run when held to a 1-1 draw by AFC Dunton, Josh St Clair Pierre netting their goal against one in reply from Tony Norman. For second place Wilstead Reserves it was an end to their 100% home record when held to a 2-2 draw by bottom of the table Wootton Village. Sam Ward plus an own goal marked their scoresheet against Village replies via Adam Flynn and Kieron Mulkerrins. Whilst third place Marston Shelton Rovers Reserves drew 1-1 at Bedford Albion, Kieran Day on target for the Rovers against a Albion reply via Adam Lewis. Elsewhere the biggest win of the day belonged to Renhold United Reserves the 4-1 home winners over Shefford Town & Campton A. Michael France was with a hat-trick joined on the scoresheet by Nathan France against a lone Town reply via Jimmy Jacob. Whilst the lone away winners of the day to climb the table into fourth spot were Caldecote A the 3-1 winners at Sandy Albion, Chris Richardson with a brace plus an own goal only being replied to once by Albion’s Jack Willis. CS Rovers remain four points clear after they recorded their third win on the bounce with a 2-0 home win over Flitwick Town A with goals from Luke Ruddy and Connor Darocha. Second place Dinamo Flitwick maintained their unbeaten record with a 3-2 home win over AFC Kempston Town & Bedford College A. Dale Goldie with a brace plus a strike from Josh Pearson were replied to twice by Town’s Gavin Cheema. Now up into third spot are Henlow Reserves who maintained their unbeaten away ways in winning 2-0 at the previously unbeaten Harlington. James Campbell and John Whitehead scored the vital goals. Whilst fourth spot is now taken up by Clifton who claimed their first home win of the season with a 4-1 victory over the previously unbeaten on the road Sandy Reserves. George McMillan with a brace plus Josh Angell and Dale Houghton marked the home scoresheet against a lone reply from Andy Barker. Elsewhere Lidlington United Sports claimed their first win of the season to lifted themselves off the bottom of the league standings with a 4-2 home win over Stevington Reserves who now occupy the bottom spot. Paul Halbert with a brace was joined on the scoresheet by Jay Peachey and Dale Croder against a brace in reply from Cameron Cain.